SATURDAY AFTERNOON I found myself kneeling on the floor of the Faribo West Mall to shoot photos of young dancers performing. If my orthopedic surgeon had observed the way I crouched and bent my hip, he would have scolded me, even warned me that I could pop my 3 ½-year-old artificial right hip right out of place. Such an admonition would be well-deserved. But in those photographic moments, I forget about the health consequences and pursue shots from a perspective that best tells the story. With kids, that typically means I get down on their level, on the floor. Now getting back up, well, that can be more of a challenge. Let me show you three photos from that dance performance. They’re not your typical “proud parent” type shots and I’m certain more than one parent questioned why I was scooting around on the floor of the mall. You won’t see the dancers’ faces. Rather, you’ll notice the stance, the clasp of hands and other details that tell a story from a broader perspective. See for yourself and read how, with my minor photo editing skills, I tweaked each photo. 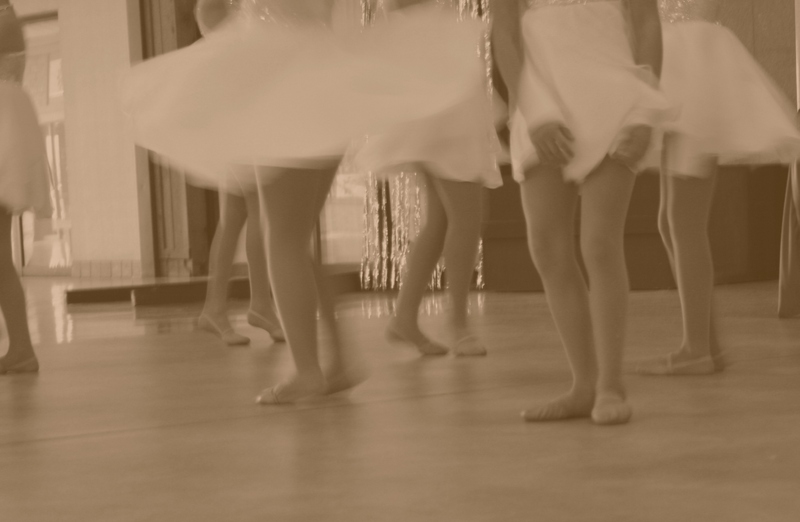 It is the pose of this little girl, holding her hands close, eyes fixed on the older dancer, that show her admiration, her "I want to dance just like her someday," wonderment. In photo editing, I cropped the image just a wee on the left to cut out a distracting red EXIT sign. I sharpened the photo slightly and lowered the saturation of the yellow. While an entire crowd of onlookers ringed the two dancers, in this frame I opted to focus solely on the two dancers to emphasize the magic I saw between them. It was as if they were all alone in the mall, at a private dance lesson. Here I crouched as low as I could without lying on the floor to capture this moment. This scene takes in all aspects of the performance from performer to the audience to those two little girls who look forward to someday dancing solo. The only editing change was a minor sharpening of the photo. When the older girls took to the mall dance floor, I wanted to showcase the movement to tell their story and to truly engage you, the reader. So I set a slower shutter speed and focused on their legs. I cropped the frame on the right and then edited the distracting colors from the image. The sepia tone adds to the dreamy, artsy quality of the photo. 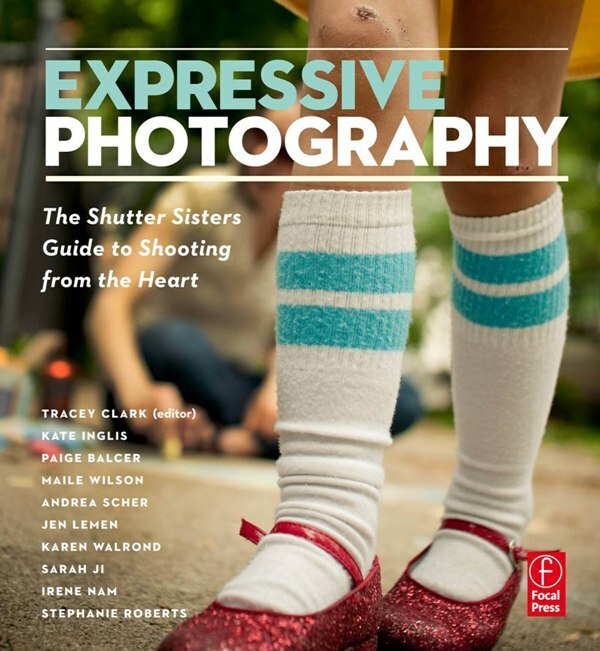 AFTER THE PHOTO shoot of the dancers, I stopped by my local public library where I found a photography guidebook that I’d highly recommend, Expressive Photography: The Shutter Sisters’ Guide to Shooting from the Heart. Check out the Shutter Sisters’ photography blog by clicking here. Their book is packed with tips about lighting, perspective, photo editing, composition and more. It’s one of the best photography books I’ve read. IT IS A RELIEF, I tell you, to have the taxes and the Free Application for Federal Student Aid filed. Both have been hanging over my head since the first of the year. Since I detest figures and forms, I fail to welcome January with any hint of enthusiasm. But somehow I manage to plow through the paperwork, sifting through files, pulling together information for the tax preparer. Yes, I pay someone to “do” our taxes because it is well worth the money to have everything done right without stressing me to the max. This year I was under additional pressure to get the taxes done early so I could file the FAFSA. My son, my youngest, starts college in the fall. Several years have passed since I last filled out this college financial aid form for my second daughter and, before that, her sister. I welcomed the respite from this task. Not that it should be so difficult given the process is done online. But, remember, I don’t like figures or forms. At all. A portion of the informational sheet my son received from Faribault High School about the FAFSA workshop. This time around, though, I wasn’t on my own. 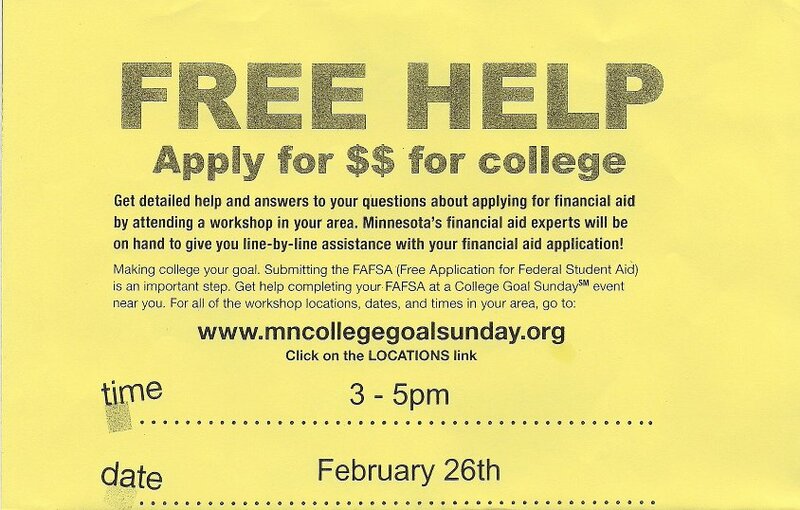 The Faribault High School Counseling Department hosted a Minnesota College Goal Sunday Workshop to assist parents and students in completing the FAFSA. Yes, my son and I were among the first in line for the two-hour workshop. I expected long lines. My expectations were wrong. I have no idea how many turned out, but certainly significantly fewer than I anticipated during the hour we were there. Computer terminals were not packed, not by any stretch. That was good for my son and me. No waiting. Questions answered as soon as my arm shot into the air, which was often. The FAFSA offers a new feature—at least new since the last time I filed—that allows applicants to connect to their tax returns. The tax return information then automatically transfers to the FAFSA app. That option failed to work for us; something about too little time elapsing since taxes were filed. Within an hour, my son and I had his FAFSA completed and zipped into cyberspace. The process should have taken us only a half hour, according to a rep from the local technical college, among three volunteers who assisted us at the workshop. Well, yeah, I shared with her that I detest figures and forms. And it didn’t help that I left my prescription computer eyeglasses at home, meaning I struggled to read the words and numbers on the monitor. FYI: COLLEGE GOAL SUNDAY is a national effort that brings financial aid professionals and other volunteers together to help students and their families complete the FAFSA. Click here for general program information about the Minnesota College Goal Program. Click here for information and a listing of workshop sites in Minnesota. Students who attend, fill out and submit a FAFSA and then complete a workshop evaluation are entered into a drawing for a $500 scholarship. Now how’s that for an incentive to participate? One student in Faribault will walk away with $500 for his/her college education. Win. Win. Even if my son doesn’t win the scholarship, we’ve still won. We got professional assistance, at no cost, to complete a task I dread. I’m just wondering. Can I return next year even though my son will already be in college? 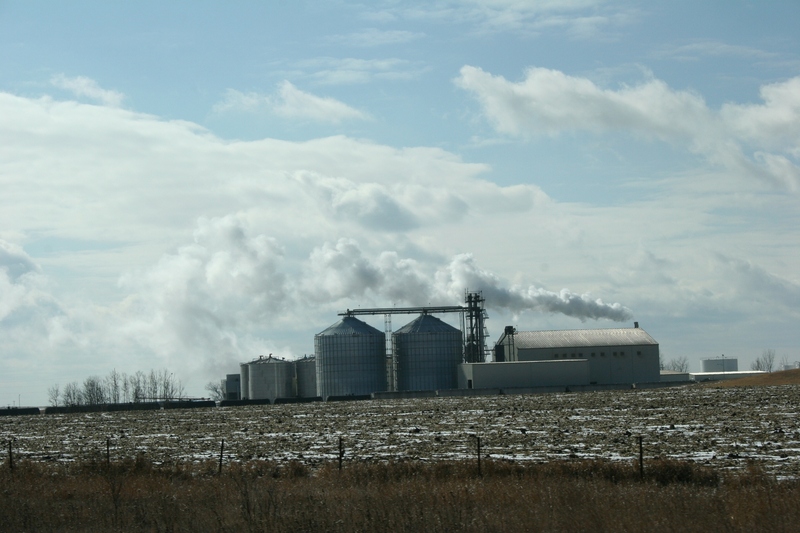 The coal-fired power plant by Becker as seen from Interstate 94. IN COUNTRY THAT’S primarily flat and open, you notice the details—the shape and height of clouds, the tint of the soil, the sharp angles of buildings, towers that break the monotony of horizontal lines and so much more. At least I notice these things. Maybe you don’t. Join me today on one final trek along Interstate 94 as we travel northwest toward Fargo, North Dakota. Begin to see, like me, man’s imprint upon the land. I am neither endorsing nor criticizing the content of these images. 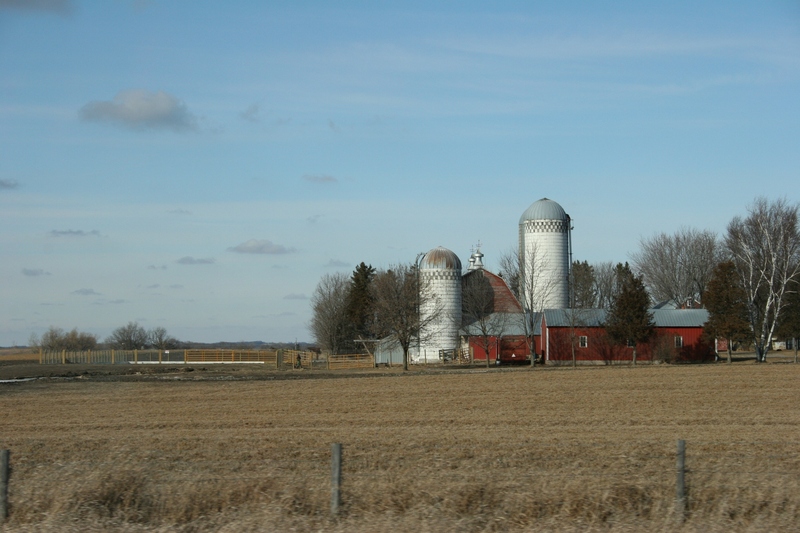 I am simply showing you examples of what I noticed along that drive, beginning near Monticello, Minnesota. I’ve already shown you the skyscapes and the farm sites in previous posts. These photos represent subjects that don’t fit into a single, well-defined category. They are, if anything, simply scenes that unfold upon the stage of this land, this wide, wide land. I'd love to know the history behind this house in the Avon area. You just don't see old corn cribs like this in use much anymore. Something about them so appeals to me visually. 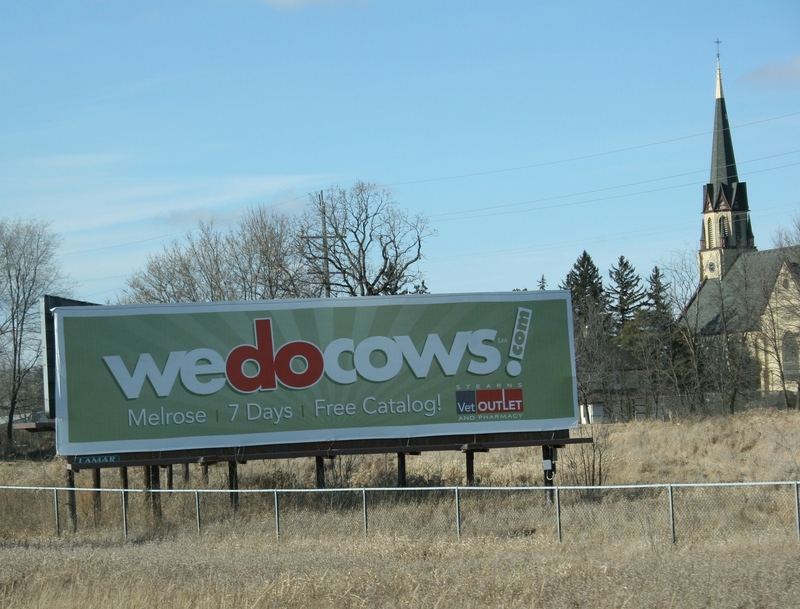 Deep in the heart of dairy country, I spotted this vet clinic sign by Freeport. Freeport, "The city with a smile!" 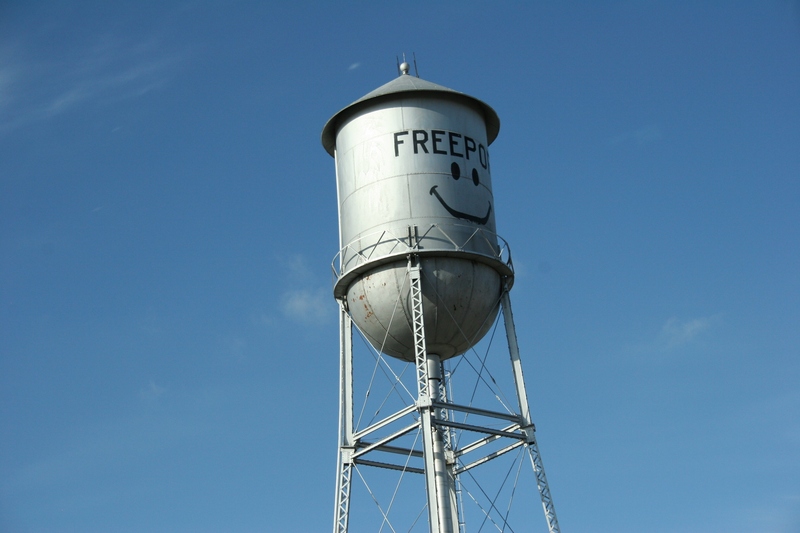 is marked by this old-fashioned smiling water tower. 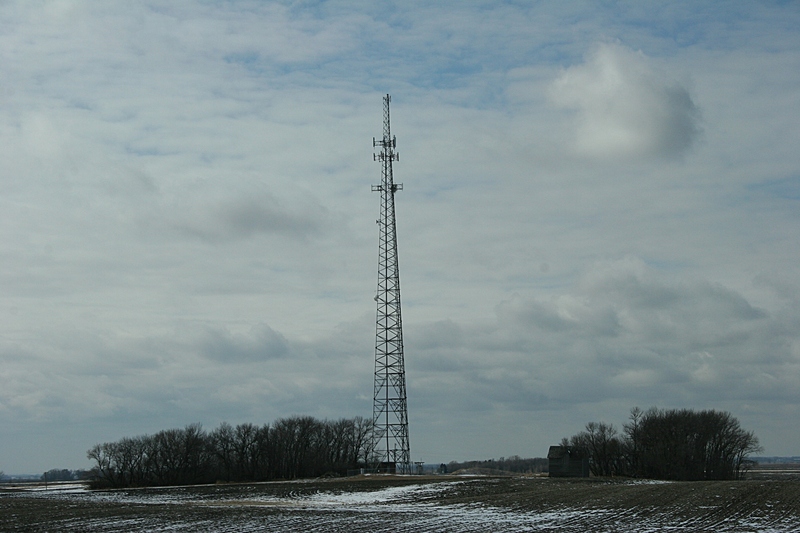 Drive I-94 and you'll see endless towers like this one where the tower dwarfs an abandoned building to the right. This country is rural through and through. 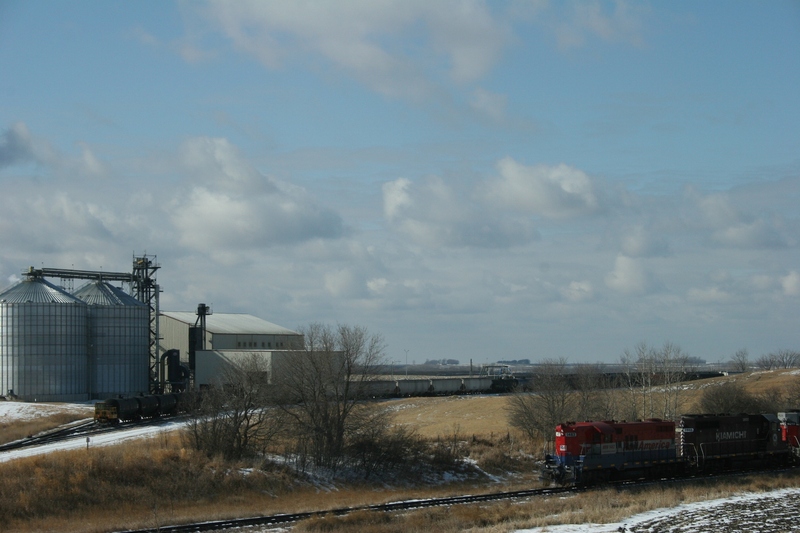 This may be an ethanol plant although I'm not sure. Anyone know? I expected to see more trains than I did. These were near the plant in the photo above. Who knew? 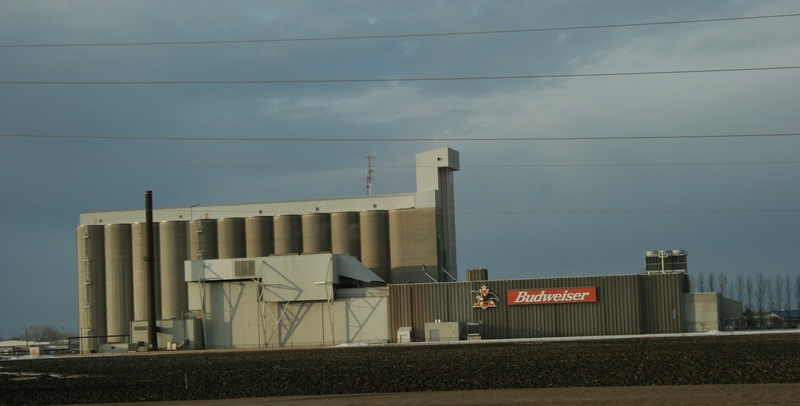 A Budweiser plant in Moorhead. 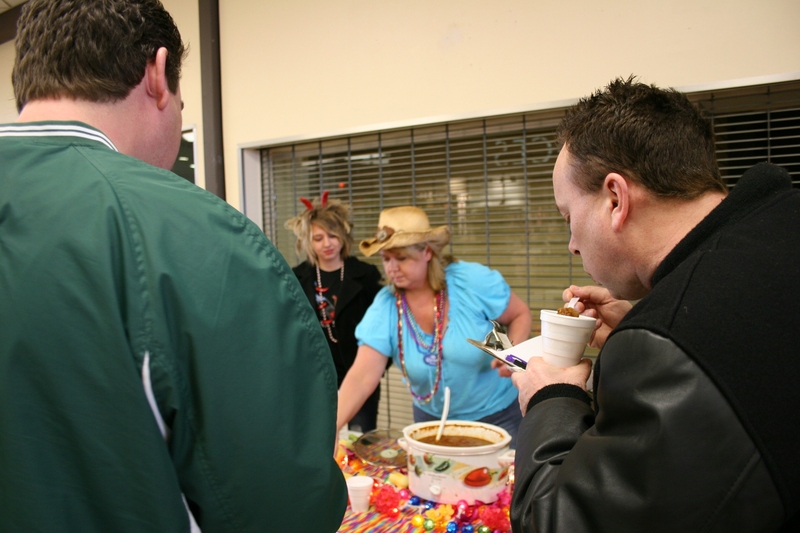 YESTERDAY THE FARIBO WEST MALL sponsored a first-ever Chili Contest. I posted about this already. But I have more photos to show you; I didn’t want to cram all of them into a single drawn-out post. So join me at the mall as we grab some chili. 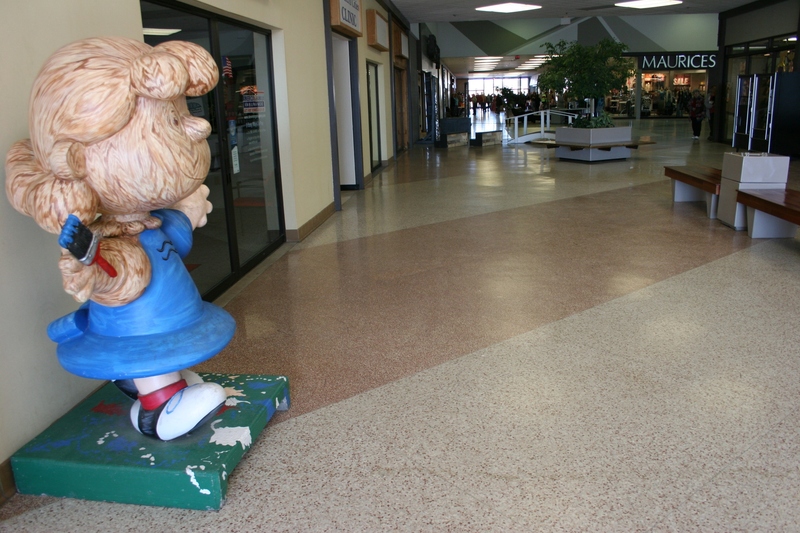 …past the Lucy statue to the crowd way down at the east mall entrance. 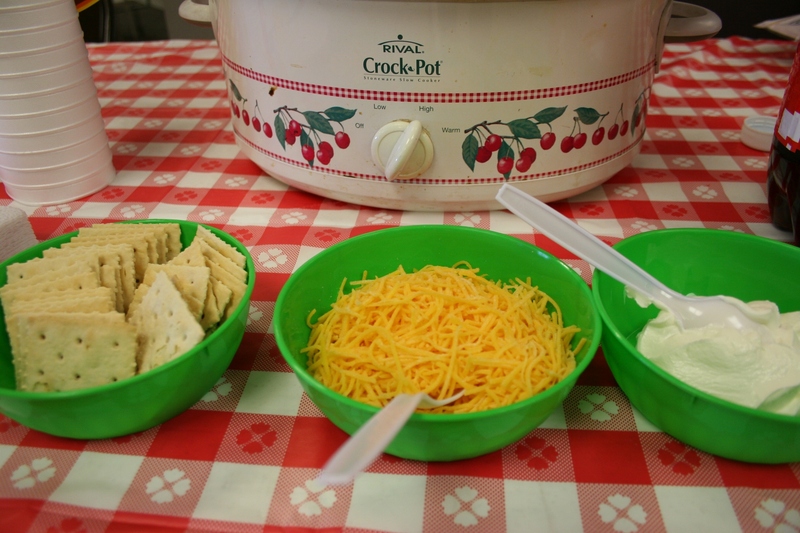 After you’ve purchased a plastic spoon for $1, with those proceeds benefiting the Faribault Food Shelf, peruse the 16 chili offerings. Don’t miss the condiments served by some contestants. However, if you want a true, pure taste of the chili or you are trying to avoid calories, you may want to skip the enticing extras. 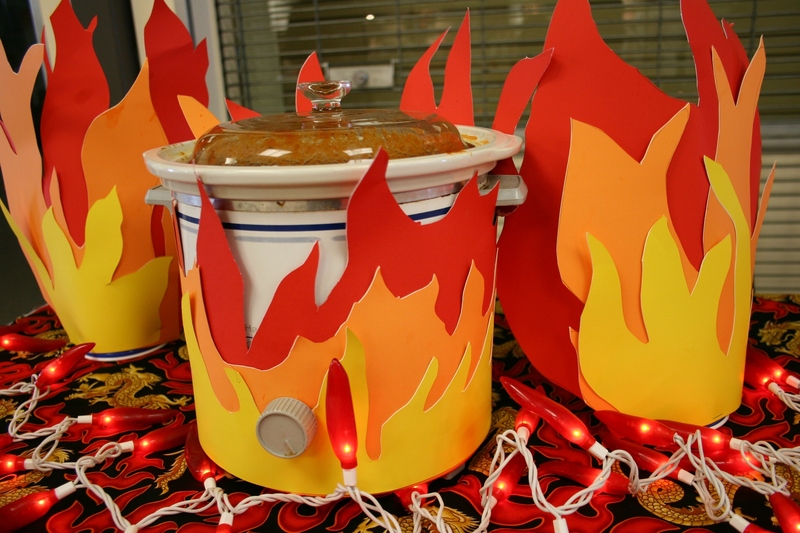 But do not skip checking out the table decor like this chili station tended by Hannah Plath serving her dad Jeff Langmeier’s hot chili. I would have awarded this table top prize in decorating. As you’re served chili, observe the details like the pepper necklace and devil horns worn by Hannah Plath to emphasize the heat in her dad’s chili. Note the judge (Faribault Area Chamber of Commerce & Tourism President Kymn Anderson) with her clipboard. Keep a watchful eye on the judges (Faribault Mayor John Jasinski, left, and Rice County Sheriff Troy Dunn) while they sample Kristen Langmeier’s chili, or any chili for that matter. You can tell a lot about a chili by watching the facial expressions of those tasting it. Yes, when I sampled one particular chili, the entrant and his family (Bill Frogge, winner on the celebrity judging), fixed their eyes on me. I willed myself not to flinch at Frogge’s fiery chili. Afterward, when they weren’t watching, I sneaked over to the water cooler. 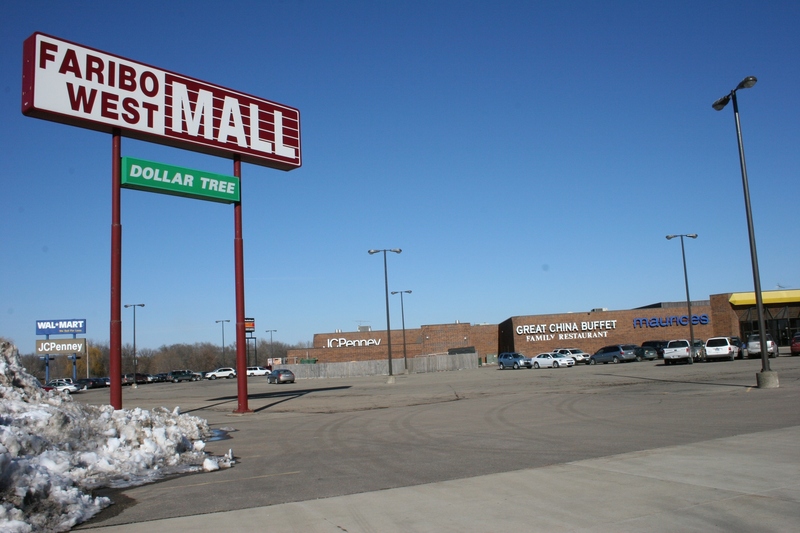 The Faribo West Mall, just off Interstate 35 and Minnesota State Highway 60 in Faribault. FROM FIERY PEPPER HOT to cinnamon sweet to overpowered by tomatoes, chilies served at the Faribo West Mall’s Saturday afternoon Chili Contest offered enough variety to satisfy any taste. My husband and I paid $1 each for a plastic spoon with which to sample the 16 chilies like those offered by Kristen Langmeier and her daughter Hannah Plath. Serving side by side, Kristen said she was competing against her husband, Jeff. 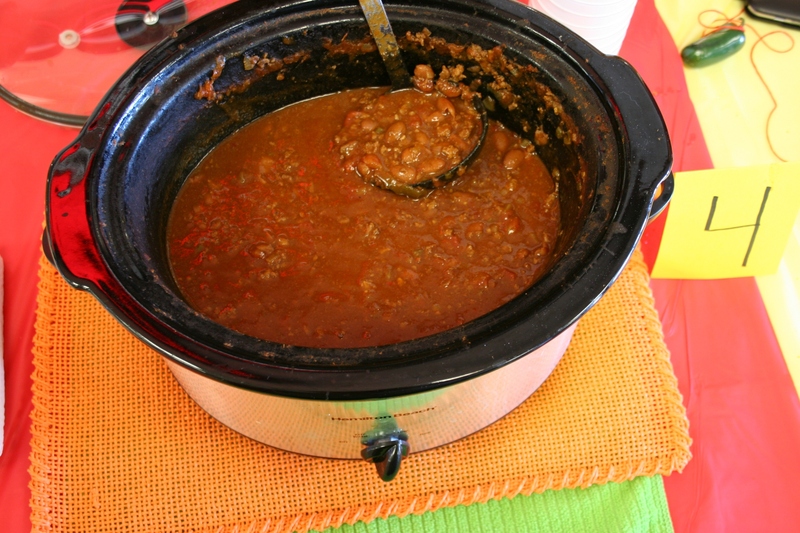 Hannah scooped up her dad’s “very spicy” no-bean chili laced with bacon and grilled steak. Kristen ladled her “regular spicy” chili infused with beer. 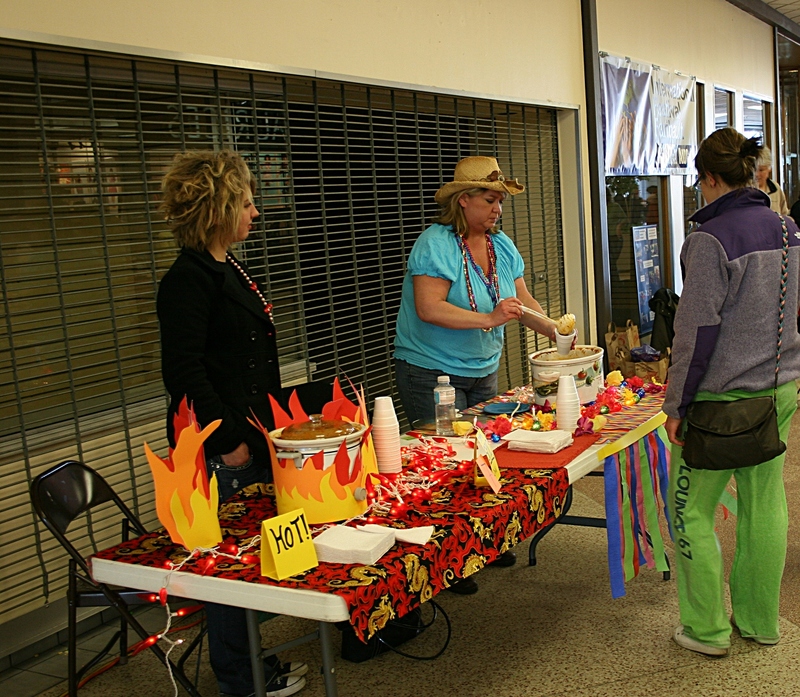 Faribault residents Hannah Plath, left, and her mom, Kristen Langmeier, served two types of chili. 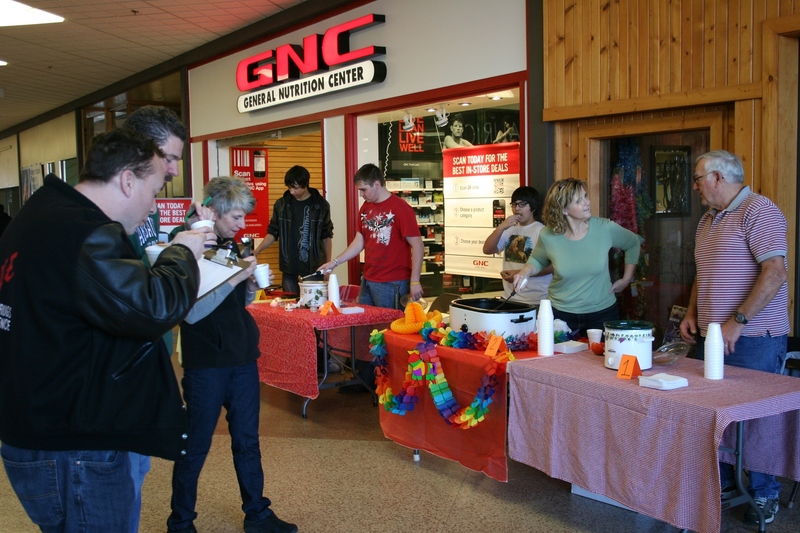 Entries were judged on taste and presentation by celebrity judges. The dining public simply chose one favorite. Celebrity judges Rice County Sheriff Troy Dunn, left, Faribault Mayor John Jasinski and President of the Faribault Area Chamber of Commerce & Tourism Kymn Anderson sample the chili. At another table, a former Texan removed the seeds from the jalapenos to quell the heat in his no-bean chili. He noted that in Texas you don’t add beans to chili. But there were plenty of beans in the Minnesota chilies along with a variety of meats from ground pork to turkey to chicken, beef and more. Once we’d tried the chilies, in between watching performances by the Joy of Dance Academy II dancers, Randy and I wandered the mall. That’s exactly what contest organizers hoped—that diners would also explore businesses housed in the shopping center. 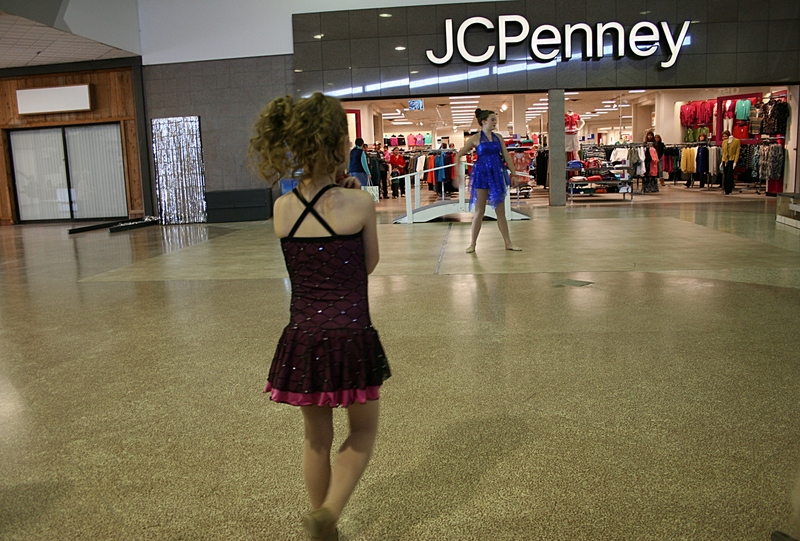 Dancers performed outside the mall's main tenant, JC Penney. Young dancers watch an older, more experienced dancer perform. I’ll be honest here. I rarely get beyond the mall’s anchor store, JC Penney on the north end, or the Salvation Army on the opposite end. Everything in between seems mostly a changing landscape of empty space and retail stores that come and go, with a few businesses, like Maurices, that have been around for awhile. 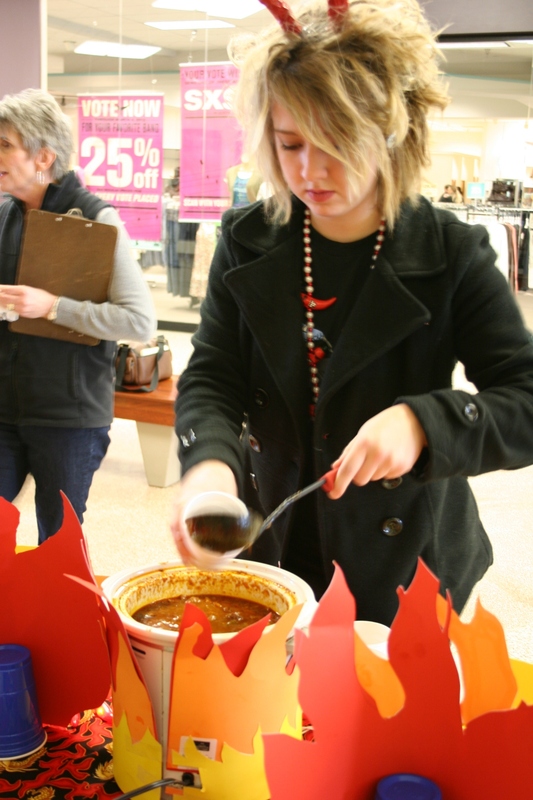 Organizers of the Chili Contest, which benefited the Faribault Food Shelf, were aiming to dispel the belief among locals that “there’s nothing at the mall.” The recent closure of the mall’s movie theater, the only one in Faribault, prompted discussion around town about the mall’s future within the community. I’m here to report that, yes, the Faribo West Mall definitely has plenty of empty space for tenants. But it also has many businesses, albeit businesses that weren’t particularly busy when we toured at mid-afternoon Saturday. I was delighted to discover this shop crammed with collectibles. Note: It's not open every day. 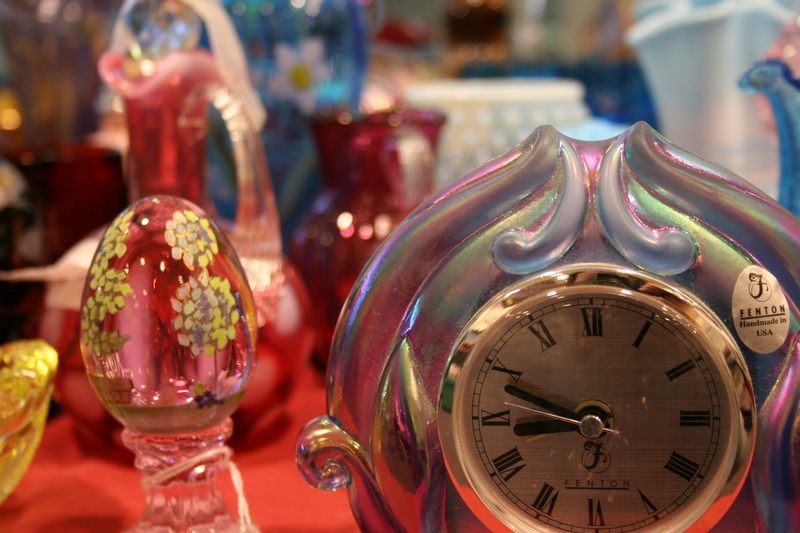 I loved the colors in this vintage clock at Terry's shop. 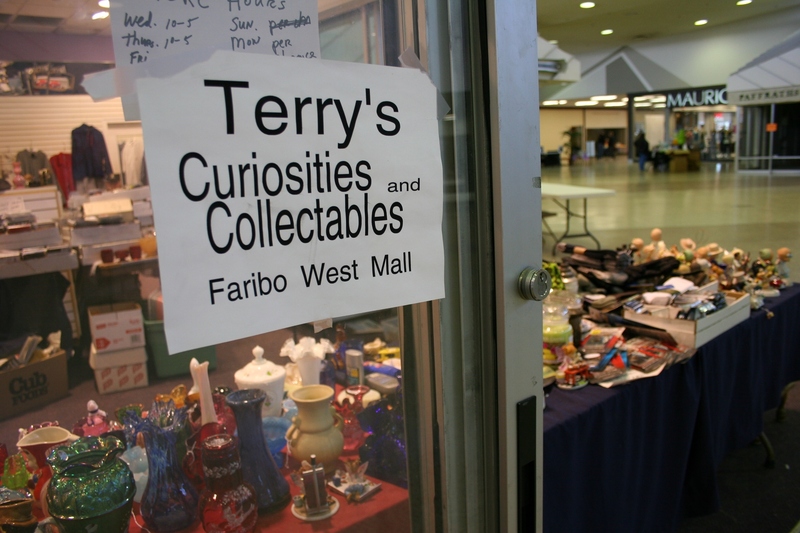 Yet, I was pleasantly surprised to discover a shop like Terry’s Curiosities and Collectables (sic) which has been in the mall for three years (who knew?) and sells everything from clothing to collectibles to sports cards and more. It’s a place I’ll return to. 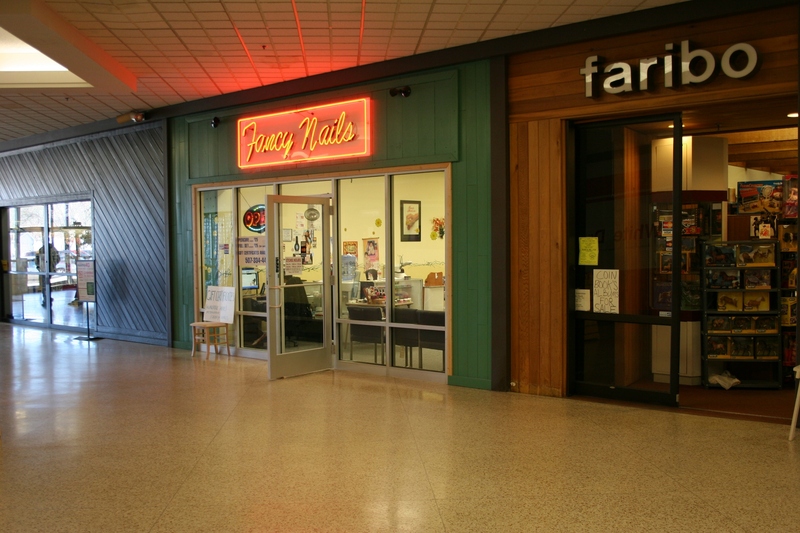 A snippet of the mall's "Freedom Shrine." 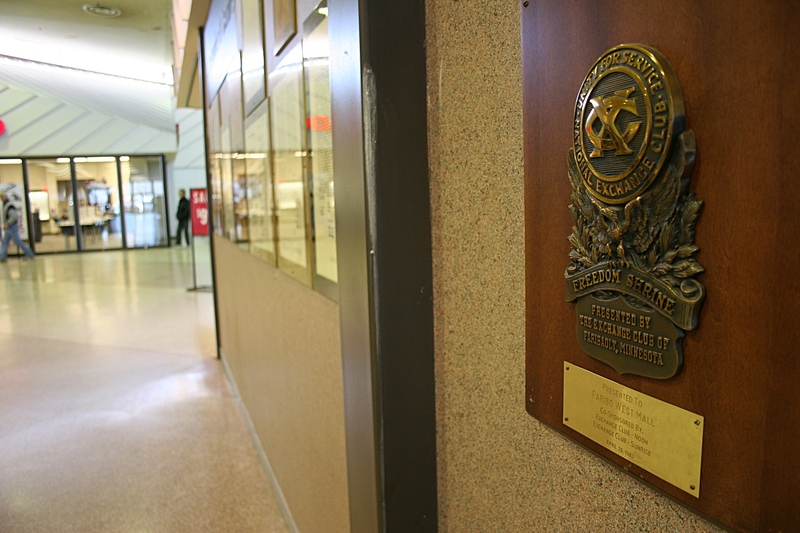 And how could I have failed to notice the “Freedom Shrine” along a mall wall featuring framed copies of the U.S. Constitution, Declaration of Independence and more? It’s been there since 1983, a year after I moved to town, for gosh sakes. That’s the problem. All too often we fail to notice and appreciate what we have. So let me show you more of what the Faribo West Mall offers rather than lamenting what it’s missing. Bella's, a cozy shop, sells these vivid shoes, helps with party planning and more. 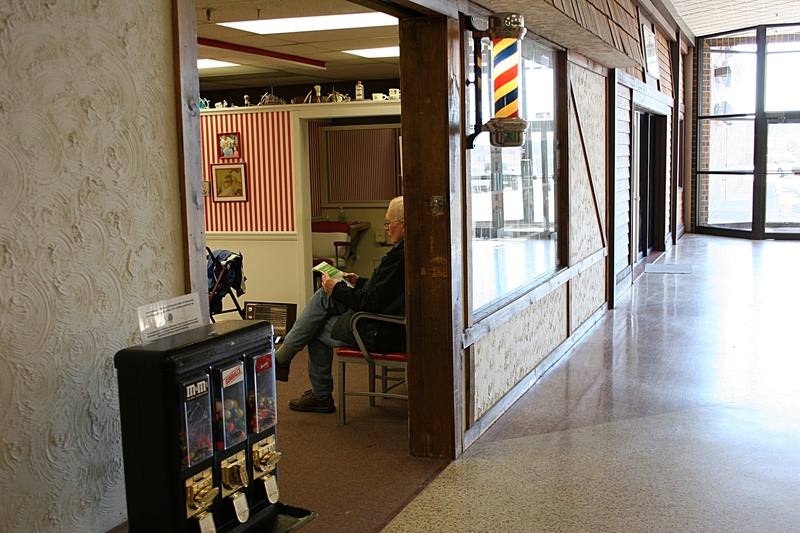 Reading a newspaper while waiting at the mall barbershop. HAVE YOU EVER read Laura Numeroff’s children’s picture books, If You Give a Pig a Pancake or If You Give a Mouse a Cookie? The storylines basically follow the premise that if you give someone something, they’ll want something else. Or one thing leads to another. For example, the mouse in Numeroff’s story asks for milk with his cookie then wants to look in a mirror and see if he has a milk mustache, etc. The pig needs syrup with his pancake, but gets so sticky he wants a bath, with bubbles, etc. 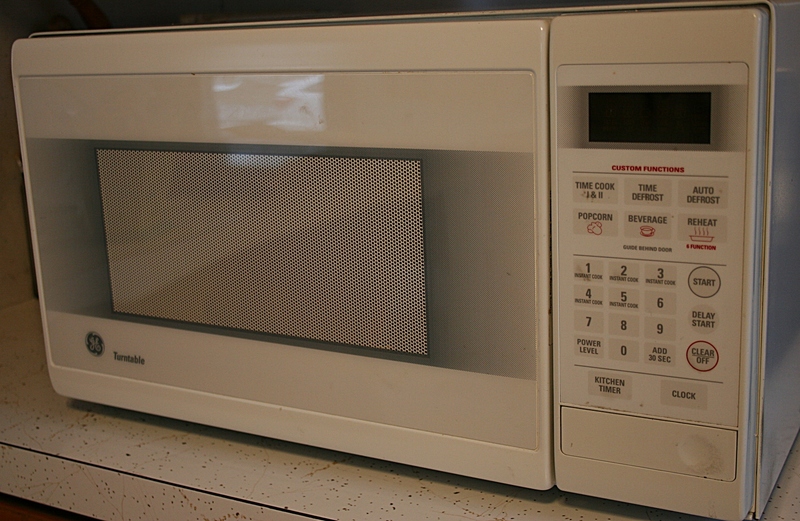 My microwave oven, useful for cooking & experiments. If your 18-year-old son hauls your microwave oven to his Advanced Chemistry class so he can measure the speed of light by melting marshmallows, you will need to find another way to prepare your morning oatmeal, or choose another food for breakfast. If you opt for sugary cereal, then you’ll break your personal commitment to consume oatmeal each morning because your Uncle John, who eats oatmeal daily, told you doing so lowers cholesterol. You’ll also derail your plan to a healthier and slimmer you. See how that storyline goes? And all because of an Advanced Chemistry experiment. 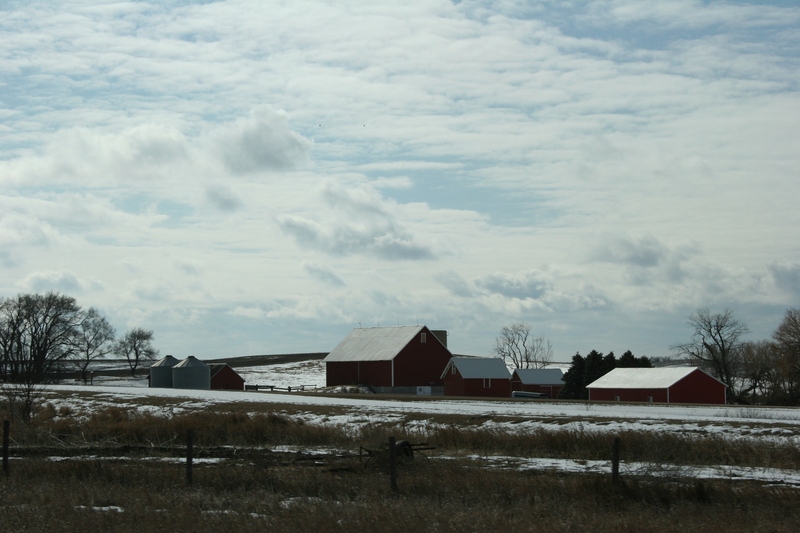 The clouds, the lighting, the red buildings slung against the sky drew my eyes and camera toward this farm along I-94 in western Minnesota. I WASN’T ALWAYS a fan of winter photography. Honestly, who likes to navigate snow and ice and freeze your fingers off to shoot images? Not me. But, since discovering on-the-road travel photography—meaning I actually fire off frames while riding in a vehicle traveling at highway/interstate speeds of 55 – 70 mph—I’ve come to embrace winter photography. 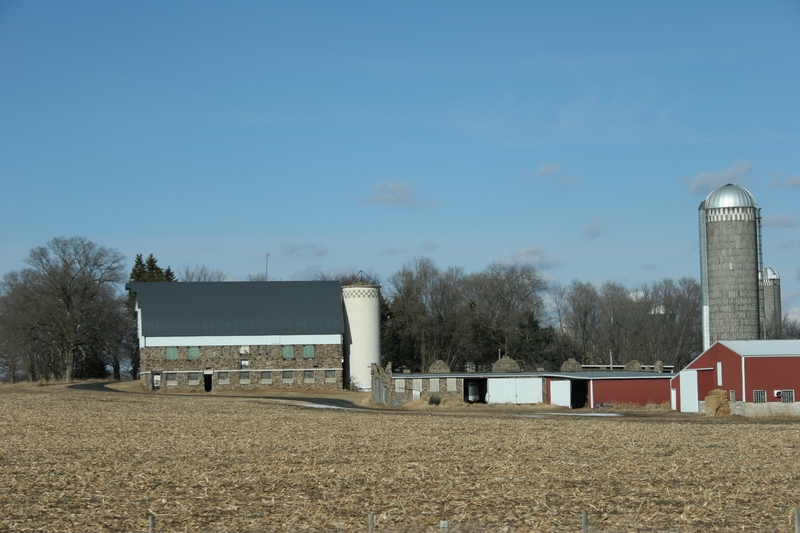 I started clicking my shutter when I saw this picturesque farm in the Avon/Albany area. This is frame two. 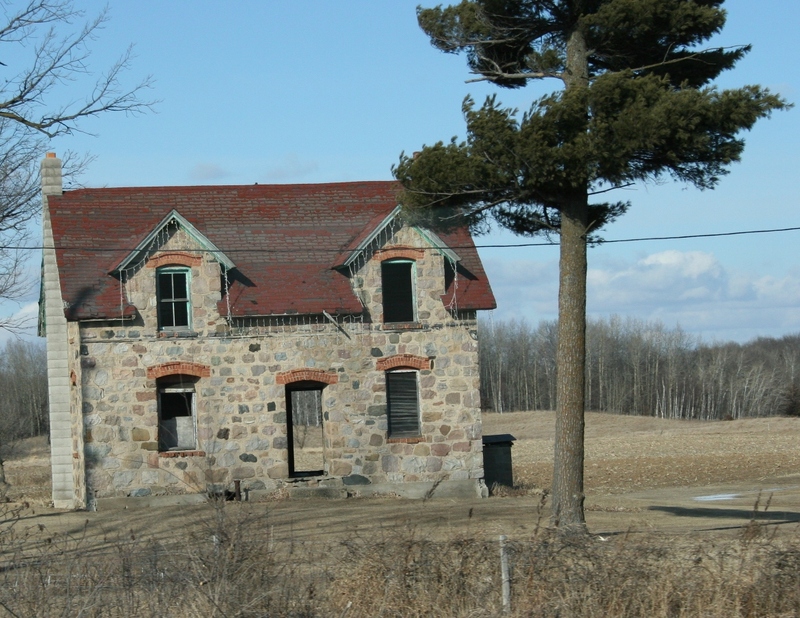 By the third frame, this beautiful fieldstone barn came into my sight line. In winter the landscape lies exposed, giving a photographer ample opportunity to see and photograph subjects which, in other seasons, remain hidden. And I, for one, appreciate that openness and vulnerability. My eyes fly across the landscape as I ride shotgun, camera in hand set to a fast shutter speed (the sports mode in automatic settings), poised to click the shutter button. The weathered barn and the lighting around the silos drew me to photograph this scene. 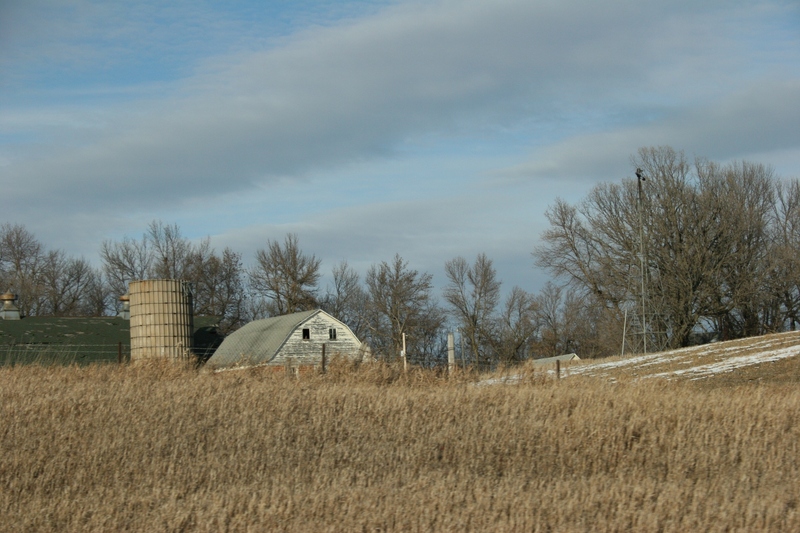 Farm sites, specifically barns, cause me to lift my ever-ready camera from my lap, focus and shoot. Sometimes I get the shot, sometimes I don’t. It’s all in the timing and the ability to compose on the fly. Consistently, the quality of these on-the-road photos surprises me, in a good way. Often I couldn’t have gotten better results had I stood still in front of the subject, focused and composed with care and shot many frames. Of course, I’ve missed plenty of photo ops, too, because I’ve been daydreaming or talking or been too slow to react. I honestly thought I'd missed this shot. But when I saw the results, well, I was pretty pleased. 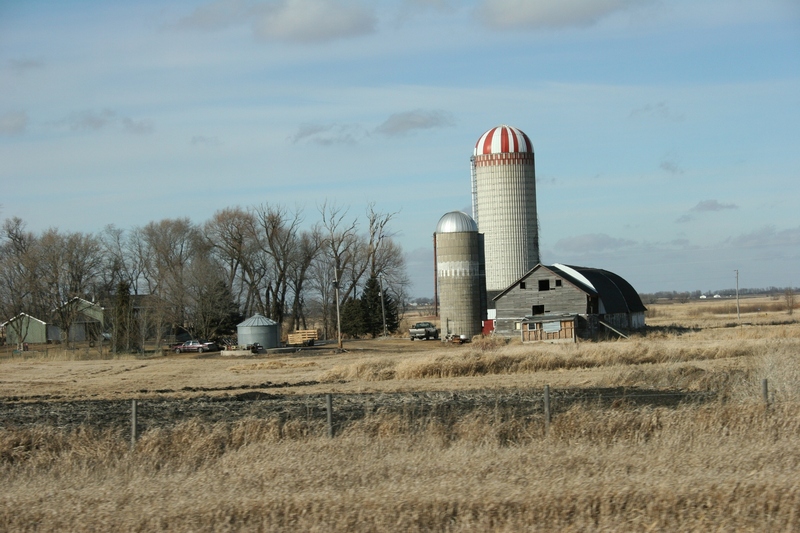 A recent trip along Interstate 94 to and from Fargo gave me plenty of time to practice on-the-road photography as I focused on farm sites, the landscape and whatever else I found of interest. An added bonus comes once I download the images into my computer and notice details I failed to see while photographing scenes. The next time you hit the highway as a passenger on a long road trip, consider trying this type of photography. Clean your windows, adjust your camera, buckle up and you’re set to roll. 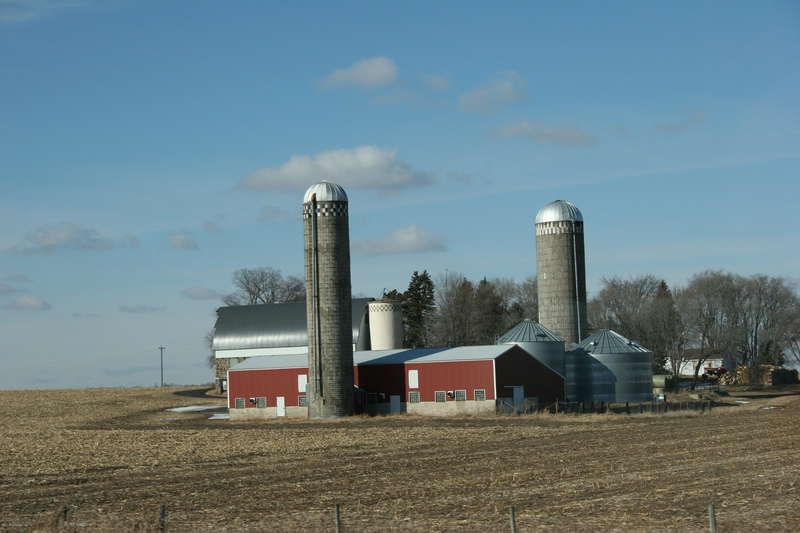 Just one more farm along I-94 that I couldn't resist photographing. TELL ME, HAVE you ever photographed using this method? What works/doesn’t work for you? And what do you like to photograph? NOTE: Except to downsize the above images, I have not edited them.